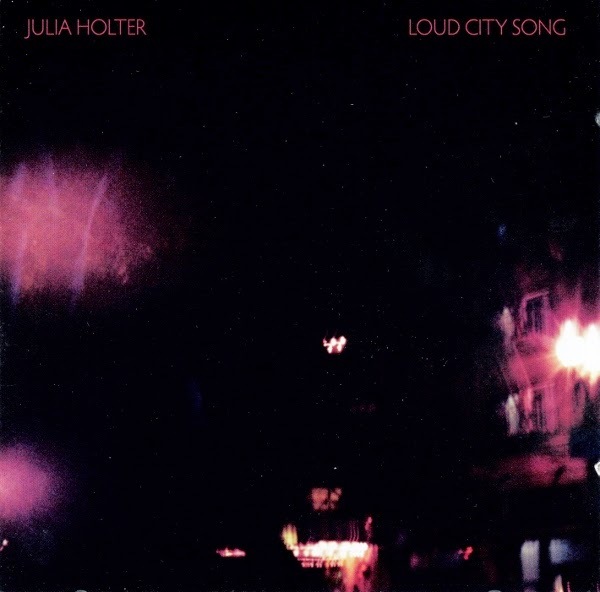 With her third album, "Loud City Song", issued by Domino in August 2013, Julia Holter clearly shows one of her intentions in its very title with the word 'Song', in the singular : she is indeed focusing on songs more than ever before. The singular could give the idea that this record is to be apprehended as one long song made of nine segments or movements; the conceptual artist rears its head again after the less interrelated approach on the previous "Ekstasis". "Loud City Song" also exhibits some further aesthetic improvements compared to Julia's earlier, and brilliant, efforts. First, Julia Holter strongly improved on the album cover, both "Tragedy" (2011), that pale grey collage thing, and surely "Ekstasis" (2012), with its bleak, blurry, amateurish pic, like some carbon copy of a lost Cocteau Twins b-sides collection, were pretty lame and generic layout-wise, in my humble opinion. Second, she improved on the production and recording process, she eventually went out of her bedroom and entered a studio with a bunch of musicians and a co-producer (ex-Ariel Pink’s Haunted Graffiti guitarist Cole M. Greif-Neill), it gives "Loud City Song" a warmer, more organic and expansive touch (even though both home-recorded "Tragedy" and "Ekstasis" already sounded remarkably refined). Like the intriguing and ambiguous (indoor or outdoor?) nighttime mood of the album cover, the nine songs composing "Loud City Music" possess for its best part an early to late night hazy and mysterious cinematic atmosphere, which wouldn't mar a movie by David Lynch or Wong Kar-wai. Musically and thematically, this record contains a loosely structured narrative inspired by the still charming 1958 Vincente Minnelli's coming-of-age musical "Gigi" (I watched it with pleasure recently) and it can indeed be experienced as one long suite of songs relating the impressions of some protagonist and/or narrator, Julia or Gigi or Julia incarnating Gigi, about the life in a large city. Julia's voice and tone, which alternates from girl to woman from song to song, or in the same song, suit the role perfectly, just like Leslie Caron did in "Gigi". If the movie took place in Paris, "Loud City Song" takes Los Angeles to decor and in so doing Julia Holter stays closer to home and delivers through her main inspiration her most personal work to date. It is also her most fragile, her light soprano voice is regularly stripped from sound effects, the instrumentation is for the largest part acoustic (trombones, saxophone, double-bass, violin, cello, percussion), she uses synthesizers in a more delicate way and the arrangements are more sober but not less sophisticated. The gorgeous and enigmatic opening track, "World", is a perfect example of this last album new refinement with its flat chant-like a capella intro quickly accompanied by soft minimal backing vocals. Julia plays with dynamics, short silent moments alternate fluidly with vocals, encapsulated or not into velvety bowed strings and droplets of delicate piano chords, which are augmented as the song solemnly progresses with light flocks of harpsichord and glockenspiel, supposedly played on keys. The song ends a capella with the line "How can I escape you". The two-part "Maxim's", named for the fame Parisian restaurant, seize the curiosity of people who love celebrity and gossip. In the musical "Gigi", each time a couple enters Maxim's the chattering diners freezes and stares at the newcomers for a second then starts whispering things people seldom say aloud, it's an amazing scene. Julia translates it in her own lyrics : "When they're loud enough, we can hear their words. By night we are inquisitory birds." "Maxim's I" and "Maxim's II" share identical lyrics while musically contrasted. The former provides a blanket of drifting and eerie strings and synths, punctuated by near indolent walking bass and drums, Julia's voice as well as the rest of the instrumentation seem like reverberating towards the skyline. Singularly moving violins interludes emerges here and there. Julia Holter discreetly reveals once again her attraction for bluesy late-night elegies already noticeable on her previous opus closing track "This Is Ekstasis". Two other songs convey a comparable atmosphere, "City Appearing" and more obviously Barbara Lewis' enchanting "Hello Stranger". The claustrophobic "Maxim's II" on the contrary stands for the loudest track here, nearly shouting vocals are cloaked into spiraling horns, strings and keys with towering percussion, some chattering found sounds materialize to plunge even further into increasingly uproaring instrumentation, Chris Speed's energetic saxophone enters the mix and we find ourselves immersed into free jazz dissonances. The aptly titled "Horns Surrounding Me" is the other comparatively loud moment on the album. Hurried footfall of a panting passersby instantly evokes something menacing is going on, Julia's robotic voice intones "Few times do I feel the breeze of a cold night." literally surrounded by thunderous horns which seemingly chase her character. A booming drum pattern reminiscing Kate Bush' "Running Up That Hill" or Fleetwood Mac's "Big Love" gives its main momentum with high-pitched layered synths and Julia's vocals getting increasingly alarmed repeating "Horns surrounding me sing so forcefully and high!" (the word 'high' is coldly and loudly echoed, it made me thing of early 80s The Cure for a fraction of second). Despite its title, "Loud City Song" is no loud album, several tracks contain a velvety and dreamy temperament verging on intimacy like the very short, minimalist and disarmingly charming "He's Running Through My Eyes". Still there is always an orchestral approach to any of Julia Holter's composition even if, like on this song, one can only find a crackling but warmly resonating acoustic piano, transparent background sheets of synth, a cello and Julia's expressively touching melancholic voice with bewitching self-made background vocals. Even velvetier is the centerpiece of the album, the already mentioned Barbara Lewis' "Hello Stranger" rendition. Julia has never sung so beautifully on record until then. The most serene song here, a musical moment of comfort although the lyrics "captures the vagueness of long-lost love [...], just the conflicting feelings of loss and hope that come from a past lover's visit" (Julia Holter in her own words). Seagulls and sea waves set the mood, Angelo Badalamenti-like organs slowly invade the scenery grounded with deep bowed cello, maybe double-bass, and Julia's nostalgic and meditative quite disembodied voice repeating "It seems like a very long time" a couple of time until Julia's soulfull yet dreamy vocals appear and haunt our ears. There is something close to Susanna and The Magical Orchestra decelerated deconstruction of pop songs on their magistral cover album "Melody Mountain" (2006). "Loud City Song" further contains two surprisingly straightforward tracks with "This Is a True Heart", maybe the most immediately enjoyable song with its 60s Burt Bacharach-like sophisticated pop appeal, and curiously the most loaded with sound effects and Julia's trademark field recordings, or her way to subvert pop music with her experimental libido. it's even remarkable to notice that so-called experimental artists are regularly among the best to (re)create vintage pop music, maybe because their approach remains fresh and paradoxically unpretentious, I'm thinking about a similar take on a real Bacharach/David song this time, "Something Big", by Jim O'Rourke on his successful yet quirky attempt at making a pop record, "Eureka" (1999). The other obvious surprise comes with "In The Green Wild". A merry acoustic bass provides the spine for this oddly poppy and rather superficial sounding song, somewhere between Laurie Anderson and Joni Mitchell with Tony Levin on his Chapman stick for an alarming instant. I consider this as the least successfully produced track of the whole bunch, the acoustic bass is too upfront, burying the other instruments under its massive feet, while Julia's vocals melody line sounds slightly generic. Entertaining but barely substantial. The long closing seven-minute song "City Appearing" rounds up the album in a fantastic way. It begins with a three notes piano, followed by lush floating strings and synths and underlined by subdued electronic bass line, later replaced by a double-bass. They are all sustained by very slow and sober drumming. The instrumentation thickens further gradually with added shimmering Fender Rhodes. Julia's voice is pensive yet a little sleepy : "So, in this late hour: maybe trouble, maybe fantasy." The whole song unexpectedly shifts after Julia sings "Maxim's on fire! ", a wall of strings and synths erupts, bordering on noise, something close to the orchestral white noise created by Scott Walker on his last uncompromising three albums. It drives the song towards a powerful conclusion, there is that impression of seeing a whole city unfurl out of the haze right in front of our eyes. "Loud City Song" is another impressive achievement in Julia Holter's quickly burgeoning catalogue and there's a feeling that nothing could stop her from delivering more of them in a very near future. She succeeds to create albums which are impressively consistent as a whole while each parts completely stand on their own like mini pop symphonies embedded in a larger one, or like a collection of only highlights from some larger opera without impeding its narrative. This album too is a musical journey through the artist's vision and perception, in this case that of a large city, its various tribulations, and eventually "about someone trying to find love and truth in a superficial society" (Julia's words). This record could be a more accessible and pop companion to one work by minimalist composer Steve Reich, the album "City Life" (1995), a recording built around urban found sounds - New York in this case - with force car horns, bits of conversation, construction work, etc. I was pretty astonished to discover here and there some sonic similarities between this and Julia Holter's works, except that the latter approach if less objective shows a more sympathetic human face being centered on... humans, and love, and hope, and fear, and so on. Finally, with "Loud City Song", and thanks to a more real musicians with real musical instruments production, Julia Holter has totally distanced herself from the shadow of a bedroom more experimental chillwave pop artist to become completely her own self, not that she wasn't on her previous works, but here it shows.